Molds are the most common form of fungi on Earth, growing both indoors and outdoors. Most kinds are helpful and important for breaking down material in nature and turning them into compost for new growth. Problems develop when it starts to grow on materials inside homes and buildings and starts to damage or destroy them, or when it causes allergies or health issues to residents or tenants. Although mold and mildew are often used as interchangeable terms, scientifically, mildew refers to the type of fungus that grows on plants (such as powdery mildew on roses). Although people often call the fungi that grow in their bathroom or on their clothes “mildew” technically it is mold. No matter which you call it, if you need information about how to deal with it — whether indoors, outdoors, in your vehicle or on various materials, we can help. 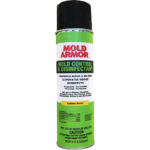 Mold grows in damp, moist and warm conditions and spreads by spores, which are tiny seed-like organisms that float through the air and grow wherever they land if conditions are right. These fungi grow fast and spread quickly, so you want to find a way to get rid of them the minute you suspect any growth or smell the musty odor that indicates their presence. Mold can appear in nearly every color of the rainbow, the most familiar types being white, green, red, black or brown. Visual indicators such as color are not always reliable indicators of the exact variety or potential risks. 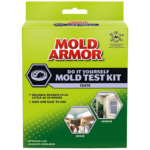 Distinguishing between different types of mold is difficult without laboratory sampling. Testing is the best way to accurately determine the species, and help you determine the right course of action. Different types have different shapes, colors and textures. It can be slimy, cottony, or powdery in texture and grow in a variety of patterns. Some are more dangerous or more toxic than others. Allergenic: this type may cause allergic reactions in susceptible individuals. 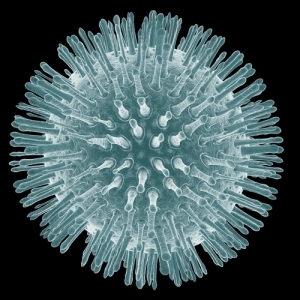 Pathogenic: this type may cause infections in people with compromised immune systems. Toxigenic: can be toxic to everyone. It spreads quickly. A small spot can take over a whole area, wall, ceiling or room in no time. It begins to reproduce in as little as 48 hours. Mold can damage and destroy possessions and property, including the hidden structure that is holding up the building itself. It can be a health risk — from minor allergies to serious respiratory conditions. Many green molds are some form of the Aspergillus fungi. This word sounds a little bit like “asparagus” which is an easy way to remember its color. There are more than 185 types of this fungus, some of which are linked to allergies or health problems. 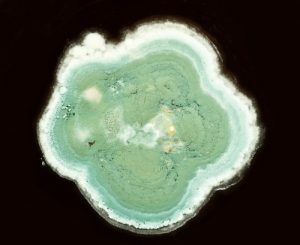 A rather serious infection called Aspergillosis — caused by breathing in the spores of green mold — usually shows up in the lungs, but also in the ears, eyes, nose and sinuses. It can even get into the brain. A mold test kit is the only way to know for sure. Protective equipment is always recommended. Aspergillus fumigatus: This species of green mold is known to cause allergies and infections. It is usually found in decomposing materials. Aspergillus flavus: The green mold commonly found growing in water-damaged carpets. In the outdoors, it can be found growing in dirt, dairy products and certain crops. If inhaled or swallowed, serious infections such as ear, throat, lung or sinus infections may result. In indoor environment it is commonly found on damp walls, wallpaper, floor and carpet dust, tarred wooden flooring, humidifiers and HVAC fans, bakeries, shoes, leather, and bird droppings. Strains of this mold may produce aflatoxin, a Class 1 carcinogen. Aspergillus niger: This green mold (usually very dark gray or black in color) can be dangerous to humans if inhaled because it has been known to form a ball in the lungs. Some — but not all — forms of Aspergillus are toxic molds, which means they produce and give off some dangerous byproducts called mycotoxins (poisons) such as aflatoxin and achratoxin, both of which produce a number of health conditions and both of which can be carcinogenic. Sometimes Cladosporium looks dark green and black. This is a different type of fungi than Aspergillus. Cladosporium is a sometimes-toxic mold that grows on fabrics, wood, tile, grout, and in damp bathrooms. It has been known to cause asthma. Stachybotrys commonly called Black Mold or Toxic Black Mold can also sometimes look green. Media sensationalism has caused a great deal of fear about black mold. But not all black molds are toxic, and not all toxic molds are black. For example, the black slimy stuff that commonly grows on the grout in bathrooms is probably not the dreaded kind known as Stachybotrys (pronounced Stacky-Boatris), but you will want to test to be sure. Make sure you wear protective clothing and equipment when you do so. Removing Stachybotrys should always be done by a professional. Black Mold, also known as Stachybotrys Chartarum is a toxic greenish black fungus found worldwide that colonizes particularly well in high-cellulose material, such as straw, hay, wet leaves, dry wall, carpet, wall paper, fiber-board, ceiling tiles, thermal insulation, etc. Before it dries, this fungus is wet and slightly slimy to touch. “Stachy” is cosmopolitan and grows naturally on straw and other cellulose containing materials in soil. In the indoor environment, this black mold is commonly found together with Stachybotrys Chlorohalonata on cellulose containing materials including paper, canvas and jute which are wetted to a water activity > 0.98. In a study conducted in Denmark, Stachybotrys Chartarum was found to produce a number of mycotoxins including macrocyclic trichothecenes, satratoxins and roridins when growing on building materials. However, only 35% of the isolates from buildings produced the extremely cytotoxic mycotoxins, the satratoxins. This led to the conclusion that idiopathic pulmonary hemosiderosis in infants is possibly not caused by satratoxins but by other S. Chartarum mycotoxins. The optimum temperature for growth for Stachybotrys Chartarum is 73°F (23°C) with a minimum and maximum temperature of 35°F (2° C) and 99°F (37°C) respectively. Stachybotrys produces a mycotoxin that causes animal and human mycotoxicosis. This type of black mold is thought to be a possible cause of the “sick building syndrome”. In May 1997, the Journal of the American Medical Association carried a news article titled “Floods carry potential for toxic mold disease”. Often people seek to define mold by its color. Unfortunately, color alone isn’t a reliable determinant of what you’re dealing with. There are harmful and non-harmful varieties in each color group. For example, red molds can be potentially harmful or completely benign. There is a common form that affects food grain crops and causes a fungal disease. There is also a potentially harmful household mold that can appear red or pink in color. The most common of these, Fusarium, is the same pink/red variety that can kill lawns. It also grows well in wet, poorly ventilated indoor areas such as shower stalls. Mold testing can accurately determine the species growing in your building and help you determine the right course of action. Household mold — often called mildew — can cause a lot of problems because it grows quickly, spreads fast, destroys whatever it grows on and can cause allergy and asthma reactions as well as more serious health challenges. It also creates an unpleasant musty odor. It is important not to ignore the presence of mold or mildew. Some types have toxins — called mycotoxins — that can be dangerous to breathe in or come into contact with. Even if you’re not dealing with a toxic variety of red mold, household and property damage may result. Aspergillus versicolor is red mold commonly found on carpet or drywall that has gotten wet or damp from leaks or flooding and is usually readily visible due to its orangey red color. 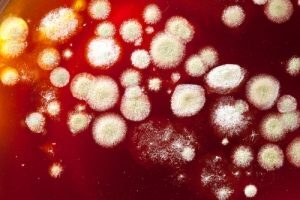 Rhodotorula is a reddish orange yeast (also another form of fungi) that will sometimes be present on water-damaged flooring, walls and ceilings. When people use the term “white mold” they are most often referring to a plant disease that is a fungal infection also called sclerotinia or stem rot. This should not be confused with household molds that may be white or light in appearance growing indoors, on materials or in outdoor areas. Watch for patches in any moist, damp or humid area, such as bathrooms, basements, laundry rooms, crawl spaces — and anywhere there has been water damage from flooding, leaks, or plumbing backups. A musty odor is also a good indication that you have mold and mildew growing. Some white molds (also called mildew) are more harmful than others, but no type of mold is harmless. Every kind has the potential to cause allergic reactions, asthmatic reactions or more serious health issues, and every kind has the potential to damage or destroy property, possessions and buildings. That’s why it’s best to remove it as soon as you see it growing. Use personal protective equipment. Do not touch the fungus directly or breathe near it without a respirator or other protective gear such as gloves and goggles. It is always best to test the area of growth because remediation, clean up and removal directions will often depend on the type of fungus you’re dealing with. 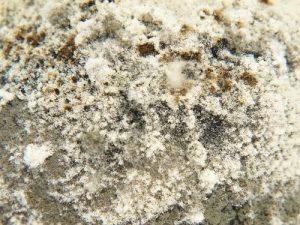 Efflorescence is a whitish deposit that occurs when water permeates certain material (for example, concrete) and leaves behind a deposit of non-toxic mineral salts — and this is sometimes mistaken for white mold, but is not a fungus at all. Not all molds are toxic — in fact, very few of the more than 100,000 species are. Finding fungi growing in a bathroom, basement, attic, crawl space, on any other indoor locations, on outdoor areas or on various materials is not cause for panic. How Can You Tell If You’re Dealing with A Toxic Variety? The short answer is that the only way to be certain is to conduct a mold test. 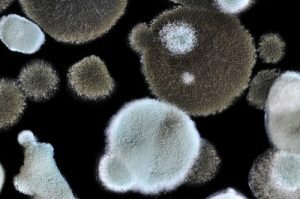 Some of the common forms of dangerous household fungi include Aspergillus, Penicillium and Stachybotrys — the “toxic black kind”. Not all toxic varieties are black, though black molds have gotten the most media exposure and may be among the most dangerous kinds. But, for example, Aspergillus can cause a variety of very severe health effects, and it’s greener in appearance, though sometimes it has a greenish-blackish hue. For sensitive or immune-compromised individuals, for the very young and very old and/or those with existing conditions, allergies or asthma, molds can cause a variety of reactions and health challenges, but that doesn’t make them necessarily toxic. Interestingly, it’s not really the molds themselves that are toxic, rather it is a metabolic byproduct — called mycotoxins — that are given off as certain fungi eat their way through whatever material they’re growing on. Exposure and danger to humans can come via breathing in the mycotoxins, getting them on the skin, or ingesting. Species known to potentially produce mycotoxins include Acremonium, Alternaria, Aspergillus, Chaetomium, Cladosporium, Fusarium, Penicillium, Pithomyces and Stachybotrys. Reactions vary greatly from individual to individual, the type of mold, and the extent of exposure, but often include cold/flu-like symptoms, fever, sore throats, headaches, nosebleeds, fatigue, diarrhea, dermatitis, and immune suppression. Some mycotoxins may also be carcinogenic (cancer causing) and/or teratogenic (causing birth defects). Tricothecene: Probably the most serious of all the mycotoxins. It is given off by stachybotrys and fusarium. It can cause a host of serious conditions and even death. Aflatoxin: from the aspergillus mold is known to be carcinogenic. Ochratoxin: also produced by aspergillus and also by penicillium, is suspected as a carcinogen and is known to impair the immune system, kidneys and liver. 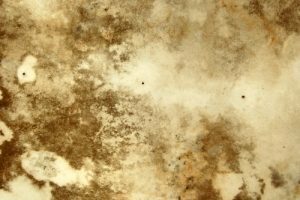 Toxic molds can grow on cloth, carpets, leather, wood, drywall, insulation and just about anywhere that moist, damp, wet or humid conditions exist. Note: Different mold species can have varying health effects, but it is important to remember that any excessive mold growth needs to be taken care of, regardless of the species because it can lead to increased allergies, toxicity, and house/building structural problems. 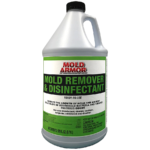 If you’re not a trained, experienced remediator, it is strongly recommended that you contact one for cleaning toxic mold. ©2019 W.M. Barr & Company, Inc.